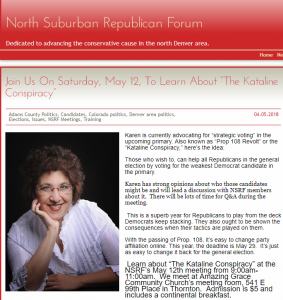 Over the past month, Kataline says she’s spoken to Republican audiences across the front range about this idea, broadly called Strategic Voting or Insincere Voting, including at the Arapahoe County Tea Party (a debate), Colorado Jewish Republicans, Denver Republican Breakfast, the Larimer County GOP breakfast, and the Jefferson County GOP Breakfast Club. She’s making her case on talk radio and online forums as well. “There is no way to know if it’s working until we see the primary,” she said when asked if Republicans are accepting her idea, adding that she personally knows some Republicans who are going to do it. Others, she said, have told her they’d love to register as unaffiliated and vote Democratic, but they want cast a ballot in the GOP primary. Some hate the idea. Why is she advocating for it? Obviously, she wants to elect Republicans, and she thinks this is a way to help do it. But she’s got other reasons too. “I thought proposition 108 [Colorado’s voter-passed 2016 election law allowing unaffiliated voters to participate in primary elections] was terrible and should be repealed. Most Democrats pushed it, and some Republicans did, for reasons I don’t understand,” said Kataline. Before 2016, Republicans would have had to register as Democrats to vote in the Democratic primary. Strategic Voting, which has been promoted elsewhere by partisans, is legal, but it’s deemed nefarious by critics, who see it as thwarting the will of partisan voters in a two-party system. The spirit of democracy is not to try to manipulate elections but to vote for the best candidate, they say. Evidence that groups aligned with the Democratic Party in Colorado are employing this strategy, as Kataline is doing, could not be found, though Kataline says progressive groups have spent money on ads in GOP primaries in the past. But I reminded Kataline, who’s podcast is called Spouting Off, that Republicans have been mucking around in Republican primaries. Ask Tom Tancredo and former New Jersey Gov. Chris Christy. Kataline’s campaign has some backing in the conservative underworld, in the form of KNUS host Chuck Bonniwell, who’s argued that Republicans should consider the strategy in certain races. Co-host Julie Hayden says it’s something worth considering. Under Colorado law, all unaffiliated voters will receive primary ballots for both the Republican and Democratic Parties. They can choose which ballot to return. If they send back both, their votes will not be counted. Unaffiliated voters also have the option of requesting a ballot from one party or the other from the Secretary of State. Registered Republicans and Democrats will receive the primary ballot of their party only. Given the state of her party, I have no doubt many likely will switch to unaffiliated…not for the reason she is suggesting, but out of pure disgust with the direction that Putin is leading them. "this idea, broadly called Strategic Voting or Insincere Voting"
No. It is called ratfucking. I call it sandbagging and I've been known to do it. I was registered Republican for years so my wife and I could work the same precinct as election judges. Where does Ms. Kataline think this is going to make a difference? I don't see what it is likely to do in any of the US House races. Doesn't seem there is a tight primary race where this game would have an impact at the state-wide races. So that would take it down to the State Senate or House districts — where virtually no public polling exists, so it would be difficult to guess where to be "strategic" or "insincere." It takes so very little to qualify as a “right wing thinker” these days . . .
. . . and even with that low bar, there are so very few. 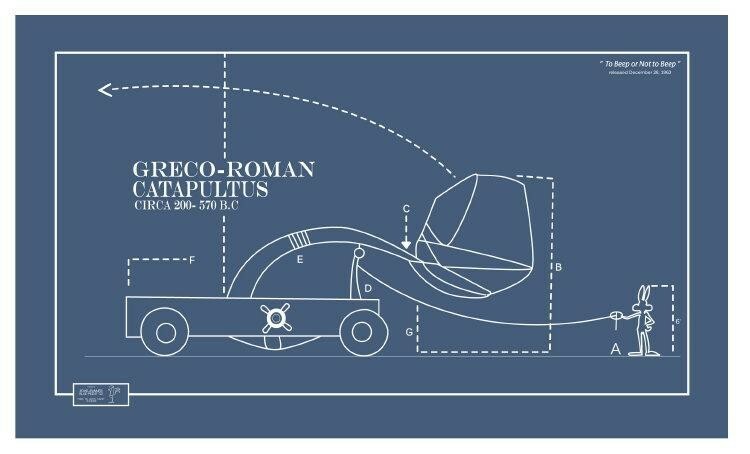 Brings to mind the Conspiracies of Catiline, as identified by Cicero, the great Roman orator. More along the lines of . . .
. . . Warner Brothers.